There’s something comforting in traveling a familiar trail where you know the curves, hills, rocks, trees, and stream crossings by heart. When, even in winter, you know that this very spot where the path bends will be covered with flowers in three months’ time. You know this because you’ve seen it year after year. And then there are the new trails. When you see a new trail leading off into the woods, and your eyes light up with curiosity and excitement. It calls to you. I always want to know where that trail leads. How many times have you said, “I’ll just hike up to the top of that ridge for a look” only to continue on to the next ridge and the next? On rare occasion, we’ll hike a new trail only to learn that we don’t ever need to hike that trail again (poorly marked, unmaintained, too hot, too buggy, too dangerous, too crowded). But most of the time, it’s a delightful discovery. I am especially fond of shady hikes with good breezes, nice views, and lots of huckleberry plants growing on the hillslopes. We found one of those today. I’ll be sure to revisit that one often – particularly when the hucks start to bear their precious berries. It’s that way with recipes too when you revisit an old one that you loved but had forgotten about. 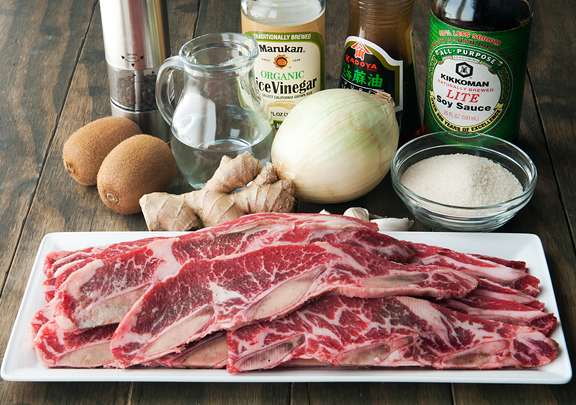 I made galbi – Korean barbecue short ribs – for my parents a couple of weeks ago. When I went to dig up my recipe from the archives, I noticed the post was nearly seven years old. That was back in the day when our local Whole Foods had no clue what flanken-style ribs were. These days, they do know, but we now have a couple of Asian grocers within striking distance that also provide flanken-style beef short ribs. 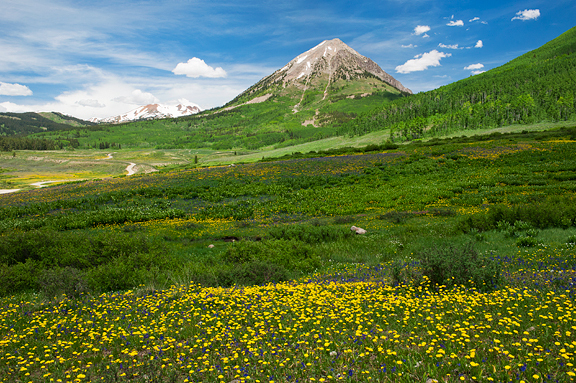 The Asianification of Colorado – slow, but happening. So let’s do this properly. Soaking the ribs in water is mainly to loosen and remove fine bits of bone from the ribs due to the nature of the cut (and the method for cutting them). 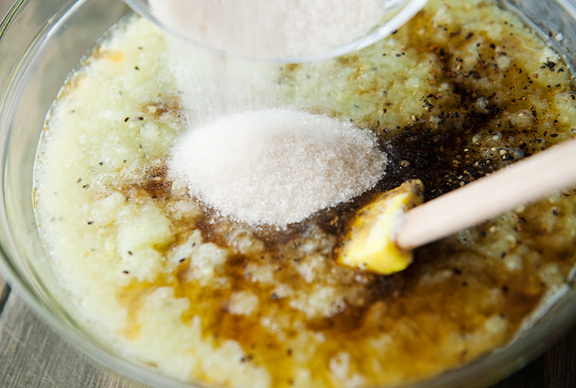 If you don’t have the time to soak them for even 30 minutes, at least give them a rinse under cold water. Just be prepared to have your hands covered in beef fat by the end of the process. While the ribs soak, you can prepare the marinade. 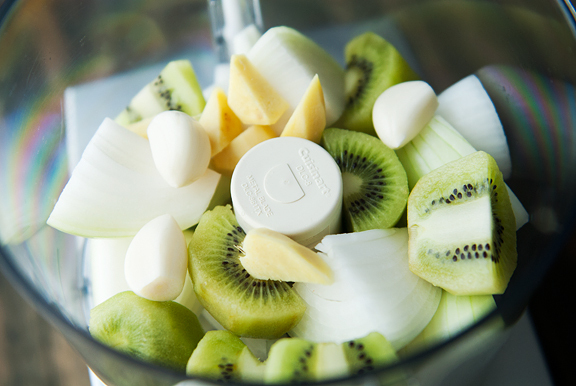 I’ve made this marinade with a pear and with kiwi fruit, and I prefer the one with kiwi fruit. 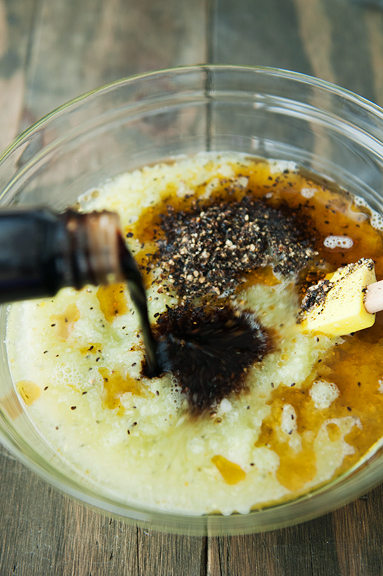 Next, stir the remaining marinade ingredients into the purée. 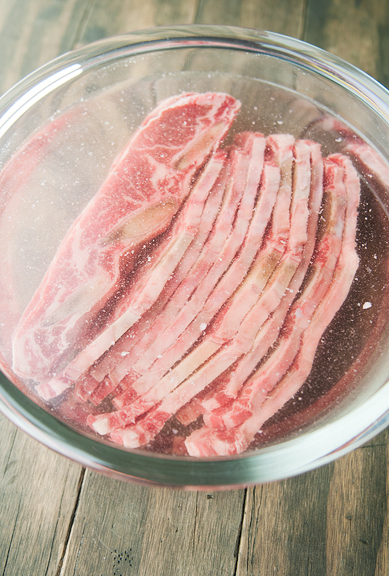 When your ribs are ready and rinsed off, place them in a large baking dish or bowl, or a gallon ziploc bag. 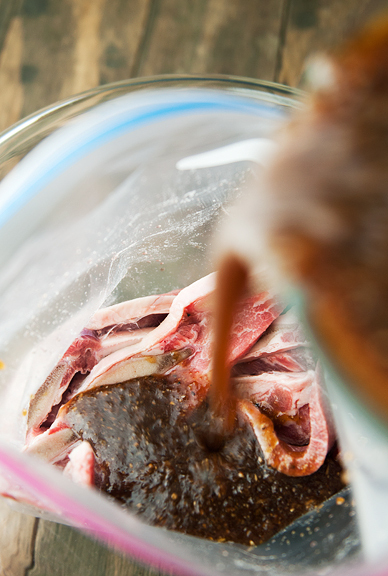 Pour the marinade over the ribs and mix them about to ensure that all of the ribs are getting quality time with the marinade. Place them in the refrigerator to marinate for 8-10 hours. When you’re ready to start cooking, fire up your grill to high heat. Cook the ribs to your desired doneness, flipping once so both sides get nicely charred. It takes a few minutes to get to rare, a few more to get to medium and beyond. If you don’t have a grill, you can sear these on a lightly oiled cast iron skillet on high heat. 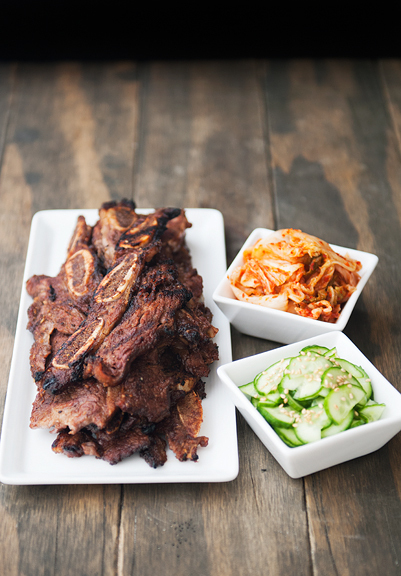 Once the galbi is done, you can eat it straight up, with rice, kimchi and other banchan, in a lettuce wrap, or in a taco – whatever you can think of. You can also use boneless beef short rib meat, or substitute pork for the beef. If you’re willing to share with friends, this could be great for summer parties because it’s so quick to cook. 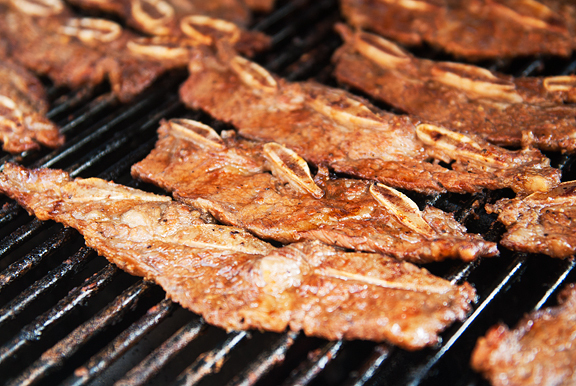 I’m just thrilled to have galbi back in rotation for our summer! Wash ribs of any bits of bone. Soak in water for 1 hour. Drain off the water. 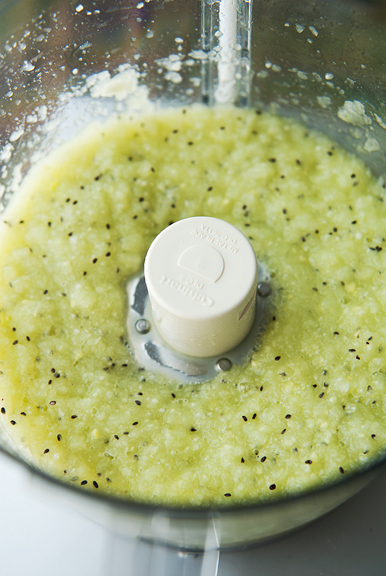 Process the kiwis, onion, garlic, and ginger to a fine purée in a food processor. Add remaining ingredients to purée and place in a large ziploc bag with the ribs. Marinate for 8-10 hours. Grill ribs on high for 2-3 minutes a side for medium to rare. Serves 4-6. Huh…kiwi or pear marinade…and again I learn something new from URB. 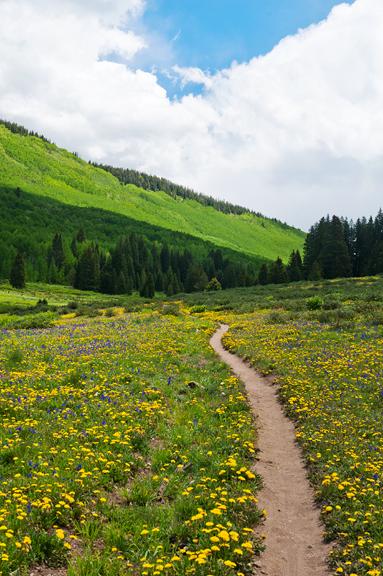 Trails are seductive. We don’t have many ridges around here, but there’s always a hill, a curve, or a spot of thicker woods that won’t let us turn around just yet. 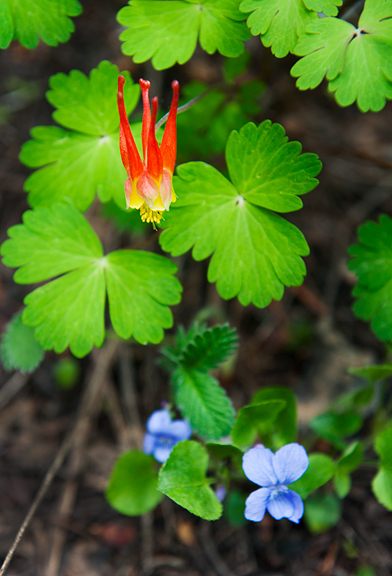 We hiked a trail last weekend that was terribly marked–it hit a clearcut and a network of logging roads, and the next blaze was non-existent. We eventually found it, but you can be sure we’ll never set foot on that trail again! 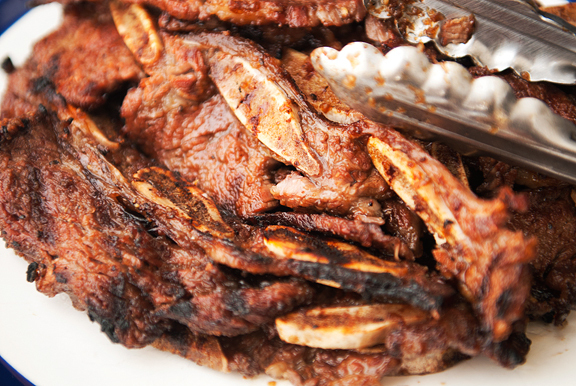 And Galbi is one of our favorite dishes to grill. It’s flavor is unlike anything else! We’ve always used Asian pear in the marinade, and I’d love to see (taste?) how kiwi works instead. We LOVE galbi! Our grocery stores don’t carry this cut of meat so I usually buy it at our Asian grocery store. Yeah, the bits of bone are difficult to get off, but it’s so worth it! 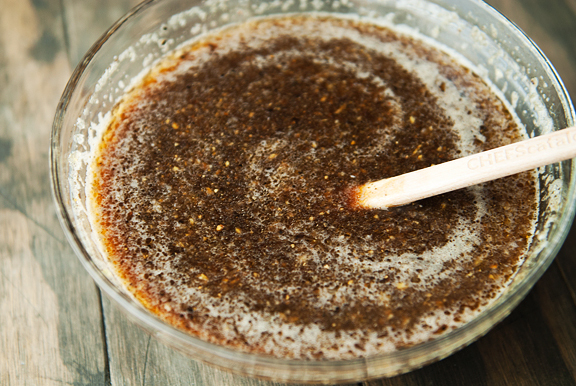 My Korean Mama always uses brown sugar. She says that people use white sugar but brown tastes better. Also, asian pear is traditional but she says you can substitute kiwi if you can’t find asian pear (though she prefers the taste of marinade with pear). Toasted sesame seeds and green onion sliced on a diagonal in the marinade. Yours looks delicious! I might have to go make some for dinner tomorrow. my hubby is allergic to kiwi, so what type of pear can I use to make the marinade? it looks so delish and I have all the ingredients, except ribs and pears. thanks! That looks fantastic. I’ve never seen that kind of cut before either…I’ll have to ask the butcher. Looks delicious! Had never thought to use with pork…which cut would you recommend? 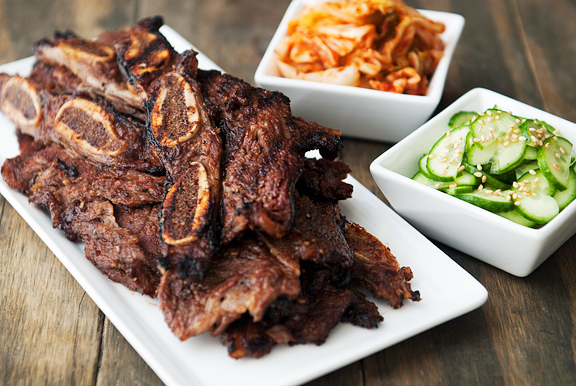 Mmmm… I love making Galbi, I use Kitchen Wench’s recipe with asian pear (she has a great Kimchi fried rice recipe too). I like to make 3X the amount for the two of us and freeze portions in marinade. Goes great with homemade kimchi! I like cold bok choy banchan (boiled 1 min, cooled, squeezed and chopped and sesame oil and seed and salt added) and the dried squid banchan. Our asian market has the cut ribs like this too, and I buy them, but I always wish there was a natural/sustainable choice for the meat, and all the products at the asian store truthfully. Thanks for all your recipes and beautiful pictures! Somehow they always seem to be in line with what I’ve been thinking about. 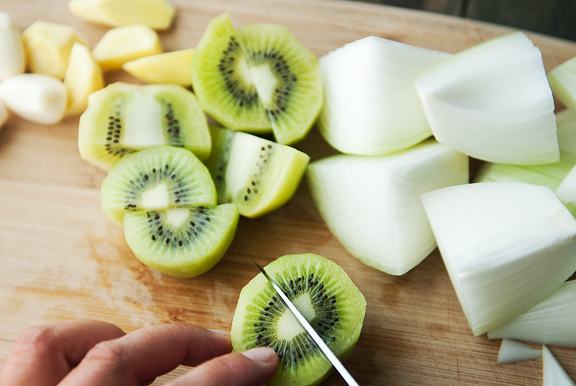 Kristin – I think the pear or kiwi will work and I’ve seen some folks use both. Brianne – The flavor is similar, but I just like using kiwi for some reason (maybe the crunchy seeds). Cindy KC – mmm, you’re so lucky to have a Korean Mama to tell you how to make these awesome dishes. Sara – yes, ask the butcher. It’s called flanken-style, but you can also maybe show them pictures on your phone? Jessica – I tend to favor dark meat, so if you can get pork shoulder and slice it thin, then that would be my recommendation! Summer – oh, great idea to freeze. I’ll have to start doing that.